Remember Maniac Mansion, Zak McKraken, Monkey Island, or Day of the Tentacle? All classic adventure games by the once-great Lucasarts. Return of the Tentacle Prologue is an unofficial sequel to one of Lucasarts' most acclaimed adventure games of all time Day of the Tentacle (which itself was heavily inspired by Maniac Mansion). 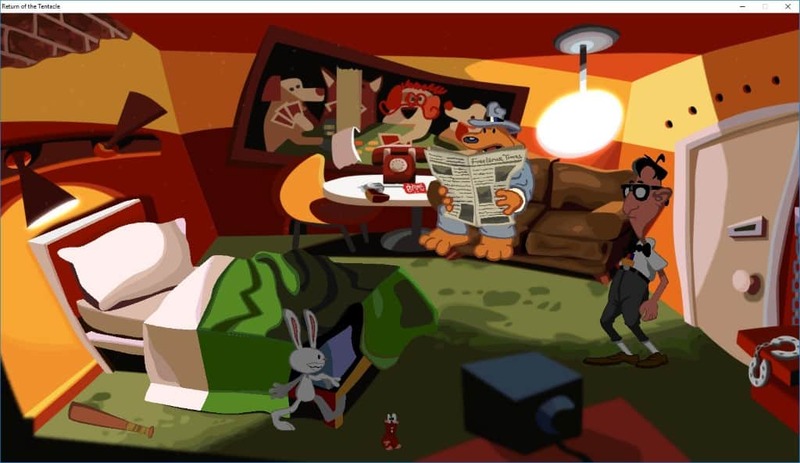 Return of the Tentacle is a cross-platform game that has been released for Windows, Linux, and Mac OS X. Downloads are provided on the official project website and interested gamers can even download the game soundtrack as well from the site. Note that only the prologue is available right now. The developers plan to release updates in the future. Purple Tentacle is back and tries to conquer the world and enslave humanity once more. The three friends Bernard, Laverne and Hoagie make their way back to the mansion of the mad scientist Dr. Fred – time travel should help saving the world. Hunt down megalomaniacal Tentacles, have bizarre conversations and solve crazy puzzles. Bernard, Hoagie and Laverne roam hand-drawn locations filled with elaborately animated characters and atmospheric music and sounds. We have done everything possible in order to capture the atmosphere and the humor of the old classic and carry it into the 21st Century. Control the characters just like in the good old 2D adventure game era with your mouse. A modern interface awaits! Apart from familiar faces of the original game, you will also encounter guest appearances from characters that belong in other games.. The game can be run right after you have downloaded the package to your system and extracted the content of the archive. Sound and visuals are of high quality, and you may play a short tutorial to get acquainted to game controls and how you play the game. It all starts with Bernard receiving a letter from Purple Tentacle in which the sender threatens the life of Bernard, Hoagie, and Laverne, and reveals plans to conquer the world once more. Game controls work fine even without the iconic action toolbar at the bottom of the screen. You can move the mouse to the bottom of the screen to display the current inventory. Moving the mouse over objects of interests highlights the name of the object and the action that is available. If you move the mouse over a door, you get options to open it if that is possible, and if you move it over another character, you can start a conversation. Conversations are multiple-choice. You pick one of the available dialog options just like it has been in previous Lucasarts adventure games. Return of the Tentacle Prologue is a well designed adventure game that Lucasarts adventure fans will certainly love. The voice overs are well done for the most part and visuals stay true to the original. If you like adventure games, you should give this one a try. Now You: What is your favorite adventure game of all time? There are several bugs in this game…..some make it impossible to go further in the game. 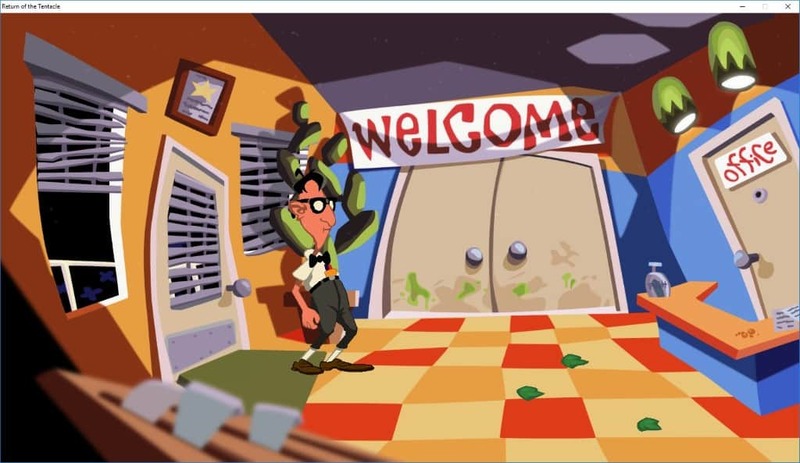 Day of the Tentacle is heavily inspired by Maniac Mansion because it’s the sequel.